…Well, maybe why isn’t as important as how. Thanks to the Land Trust of Santa Cruz County, the pumas of the Santa Cruz Mountains are on their way to having a safe way to cross Highway 17! Read more about it in their press release! We’ve talked before about how habitat connectivity is a very important part of puma biology. Pumas need to be able to around the landscape to find prey, mates, places to have their young, and safe places to be wild animals. As we increase development, we decrease the amount of habitat available to them, and we often isolate remaining habitat patches. Large, busy roads, like Highway 17, create barriers that are dangerous for pumas to cross. Crossing structures, such as culverts and wildlife overpasses, reconnect fragmented habitat patches. The Land Trust of Santa Cruz County used some of our data to locate land to purchase near Laurel Curve, a particularly dangerous stretch of road, with the hopes of restoring connectivity across the highway. 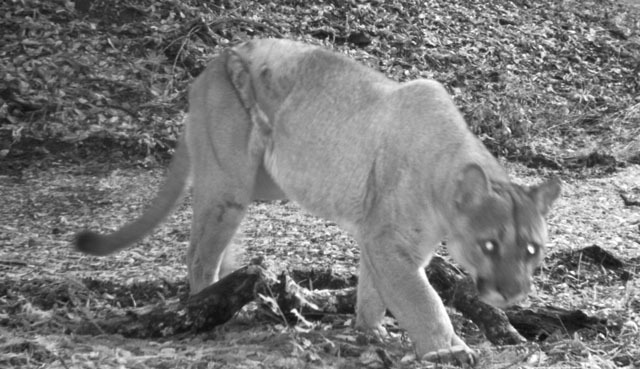 This is a very exciting new project that could help keep pumas from suffering the same fate as 16M, 39M, 18F, and many others. With any luck, creating a safe way to cross Highway 17 will serve the dual purpose of keeping pumas safe from cars, and people safe from collisions with wildlife! 16M with a large injury after getting hit by a car on Highway 17. He survived this encounter, but he was one of the lucky ones.